(ISJM) On my recent visit to Ukraine I had the opportunity to stop briefly en route to Lviv to visit the great synagogue of Zhovkva, a site that I have returned to several times since I first urged the restoration of the building*. Work has been continuing on the historic “fortress” synagogue by the Zhovkva State Historical-Architectural Reserve and the Office for the Protection of Historical Monuments of Zhovkva, under the direction of Mr. Mychaijo Kubai. 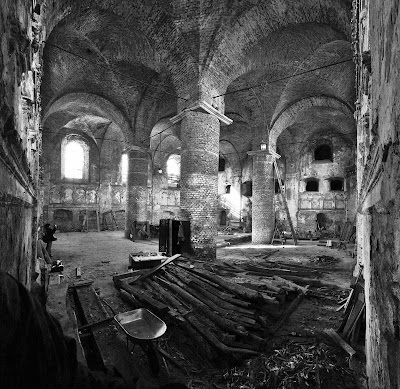 The empty and severely damaged building was listed by the World Monuments Fund on its list of 100 most endangered sites for 2000, leading to a start-up grant from WMF, and subsequent contributions for consolidation and restoration work from the Ukrainian State agencies. In 2006 (? ), a partnership was established with four engineering offices in Bavaria (Germany) which are underwriting all planning costs for the project through the "Bavaria Technology Consult of the Bavarian Chamber of Civil Engineers." Since 2007, development in the town comes under the jurisdiction of the Ministry of Regional Development, and this has brought in new money and purpose to the synagogue and other projects. Evening was approaching as my colleagues Sergey Kravtsov (Center for Jewish Art, Jerusalem) and Barbara Kirshenblatt-Gimblett (Museum of the History for the Jews in Poland) stopped in Zhovkva unannounced, but we could see work taking place removing old plaster and mortar from an exterior wall. I later learned from Ruth Ellen Gruber (see Ruth's account) and Rudolf Klein, who visited the site a few days later, that the plan calls for two walls to be treated this year, and two next year). While to the casual visitor it may appear that little has been done to date, and that the synagogue is still a ruin, there has, in fact, been substantial stabilization of the building’s foundations and walls and repair of the roof and some other aspects pf the water handling system. Expensive repairs are still needed before full restoration and any reuse begins – as much as is possible given the state of the building – but the structural integrity of the building is now secure. Future work will be expensive (the total cost of the project will be at least $US 2 million), and unless there is a single large infusion of funds it will be long. Serious discussion about what the interior should look like and purpose it will serve is still needed. The purported purpose is to establish a Central Museum of Jewish Culture of Galicia in the synagogue to consolidate dispersed holdings, but many competing museum claims need to be resolved before such a plan can be put into effect. Founded as a Renaissance town private town before 1600, Zhovkva (Polish: Żółkiew) is an important component of Ukrainian, Polish, and Jewish culture and history. The Jewish community began with the town’s founding. The Jewish center was established in the northern part, where the synagogue (1687) and other Jewish public buildings were eventually built. Zhovkva preserved its Renaissance appearance until the Second World War, during which the town suffered serious damage. At that time the town's Jewish population of approximately 4,000 was mostly murdered in a series of local executions, or deported to their deaths at Belzec and elsewhere. A sign tells the history of the synaoggue in multiple languages, but as historian Omer Bartov points out in his recent book Erased: Vanishing Traces of Jewish Galicia in Present Day Ukraine (Princeton, 2007) their is no history, monument or other commemorative or educational indication of the history or fate of Zhovkva's Jews. In 1941, the synagogue was blown up by Zhovkva’s German occupiers. The walls survived, but main hall columns, vaulting, and the annexes were ruined and/or completely destroyed. In 1955-1956, the synagogue was partially rebuilt and the entrance door and windows were recreated. The southern annex, however, and the vault of the second floor of the western annex were not restored. In 1963 the building was listed on the National Register of Architectural Monuments and Town Planning Ukraine, Protected Number 389. 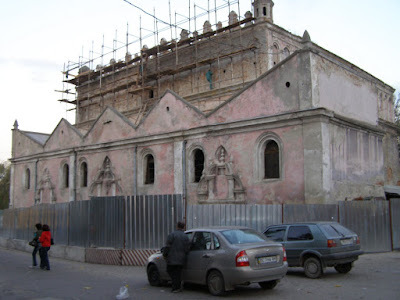 The synagogue facade was partially repaired in 1992-1993, and in 1994 the government listed central Zhovkva, in which the synagogue is located, as a State Historical-Architectural Reserve. Forty sites in the town are listed on the State Register of Architectural Monuments and Town Planning. All older repairs were made using poor materials, and when I first visited the building in 2000 the roofs and other elements – old and new – were obviously rapidly deteriorating. Masonry walls and vaults and timbers set within the load-bearing walls were overly damp, causing new problems – clearly visible - due to micro-organisms, frost and a general weakening of structural elements. Accumulated debris around the synagogue allowed the accumulation of water, increasing the dampness in the structure. Brick-work at the bottom of the south wall and inside of the building was deeply corroded, or entirely lost. In the past five years work has moved forward on phases I and II of the project. These included a full building examination and preparation of a preservation plan with preliminary designs for the introduction of mechanical systems (installation of which must wait until after Phase III when future use of the site and user needs are fully determined), include substitution of the roof structure and covering; lowering of the exterior ground level to allow proper drainage; the drying of the load-bearing walls; the restoration of brick-work in the southern wall. Work is now proceeding to remove old plaster from exterior walls and check all masonry and mortar, and to replace external windows and doors. Only when all this work on the shell of the building – all that remains – will work on the interior begin. This future (and to my knowledge still unfunded) work will include the continued study of historical, architectural and natural aspects of the synagogue and its site; the preparation of project-design documentation for the interior restoration and adaptation for museum purposes; restoration of the vault above the second floor of the western annex and making a roof above it; restoration of the wall and roof structures of the lost southern annex; installation of mechanical systems (i.e., electric, heat, water, sewage; communication and security); restoration of the synagogue interiors; restoration of the attic and the external plaster painting of the facades; clearing the obstructions and restoring the basements below the vestibule-lobby; and establishment of museum and/or other functions. It remains to be seen what will happen in Zhovkva. Certainly, the town has taken more of an interest in its Jewish past than most towns and cities in Western Ukraine. But there remains a long way to go. Just as there is no memorial to the town's murdered Jews, there is also obvious disrespect - or at least ignorant neglect - of Jewish history as evidenced by the continued use of the Jewish cemetery as a marketplace. As I explained to Mr. Kubai and others on my first visit to Zhovkva many years ago, "it is good to restore the synagogue, but if you want the support of Jews for this project, you need to reclaim the cemetery, too." * See:“Zhovkva Synagogue: Future Museum of Galician Jewry?” in Jewish Heritage Report, II:3-4 (1998-1999); Jewish Cemeteries, Synagogues and Mass Graves in Ukraine (US Commission for the Preservation of America's Heritage Abroad, 2005) . For more recent accounts see Ruth Ellen Gruber, Jewish Heritage Travel (Washington, 2007), and Omer Bartov, Erased: Vanishing Traces of Jewish Galicia in Present Day Ukraine (Princeton, 2007), and Ruth Ellen Gruber, Ukraine -- Restoration Works on the Synagogue in Zhovkva (Nov 7, 2008).